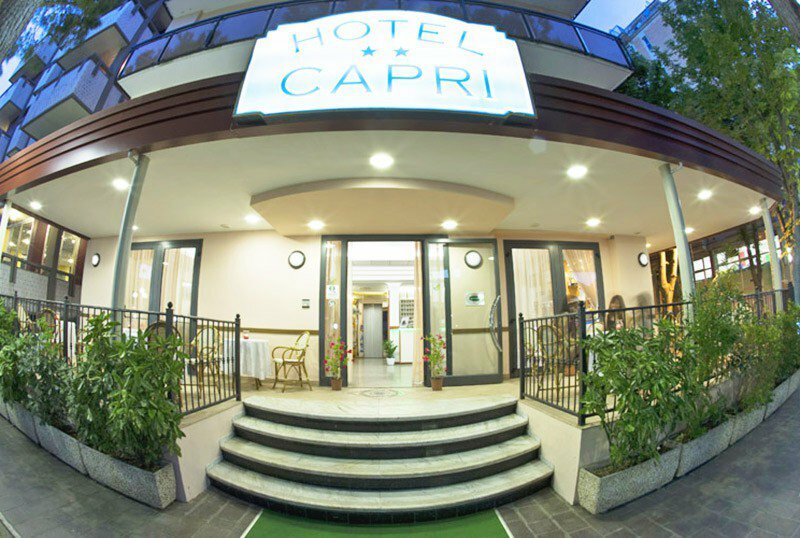 The Hotel Capri , managed directly by the owners, is a 2-star hotel located in the center of Gabicce Mare not far from the beach. The hotel has been recently renovated, ideal for families, has parking, WI-FI and rooms with balconies. It is equipped for cyclists and admits small animals. The hotel is located in the central area, a few minutes walk from the beach, as well as from the port and the center of Gabicce. The area is well served by buses and taxis. STANDARD: all with ceiling fan, safe, satellite TV and digital terrestrial, direct dial telephone and private bathroom with shower. PLUS: soundproof rooms that offer the services of standard rooms but with more air conditioning and hairdryer. FAMILIES: ideal solutions for families are available. Relaxation area on the open-air porch, terrace, bicycles available, sun terrace, living room with TV area, bar and reading area, lift and theme nights. The hotel is equipped for cyclists. PARKING: uncovered and free parking spaces at 1 km with shuttle service. AIR CONDITIONING: available free in the common areas and in the Plus rooms. DOMESTIC AMENITIES: small pets allowed. LUNCH AND DINNER: choice menu with meat and fish dishes, traditional Romagna dishes and homemade pasta. Meals are always followed by a buffet of appetizers, side dishes, artisanal desserts and fresh fruit. VARIATIONS: vegetarian, vegan and celiac dishes. In the hotel: pediatric consultation on request. At meals: dedicated menus, baby food and high chairs. On the beach: playground area, entertainment, baby / mini / junior club. The hotel has an agreement with the bathing establishment n. 20 Bathroom Peppino equipped with private cabin rental, sunbeds, beach umbrella and deck chairs, bathroom with facilities for the disabled and two showers with hot water, adult entertainment for children, baby sitter service, mini club, children's playground area, table football , ping-pong table, 2 bocce courts and board games. TAX: € 0.80 per day per person from 14 years of age, up to a maximum of 7 days of stay. Do you plan to spend this week and the sea in Gabicce? Typical menu based on fish and a lot of cordiality at an advantageous price. Minimum stay of 3 nights, full board with drinks at meals, starting from € 47.00 per person per day. Call now, take advantage of the offer. We offer you: from dinner on Sunday 28th April, to lunch on Wednesday 1st May inclusive, 3 days full board, with a typical menu based on fish, including drinks, all for € 145.00 per person. Also do not miss, Cattolica in Fiore 2019, the 46th exhibition of flowers and ornamental plants that will be held on the weekend of May 1st. Promo weeks of June and September in Gabicce! from 2 to 15 September, we offer you an all-inclusive package, 7 days full board, including drinks at the table, car parking and tourist tax at the price of € 320.00 per person. Enjoy a weekend at the beach on June 2nd. Full Board formula with a menu of fish and table drinks included, starting from € 47.00 per person per day. In Camera Plus, € 50.00 per person, per day. Discounts for children in room with adults.